View More In Figurines - Page 2. There is a lot to do and no time to waste to prepare for Santa's arrival in the mice village. Best sellers the new 2016 mice are a great addition to your mice collection. PPK includes all Nativity themed new mice figurines for a full nativity statement. 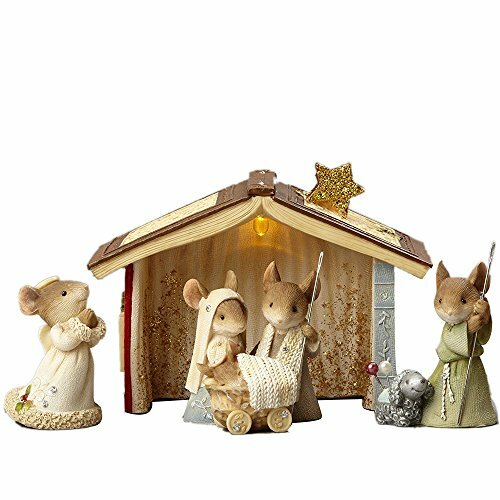 2017 new released Enesco mice nativity set. Limited edition with great price. LIGHTED Nativity Creche and Mouse Angel --This nativity crèche is even lights up! The mouse angel is wishing you all the best this holiday season. Creche Dimensions 2.99 in H x 2.56 in W x 4.33 in L.
Mice nativity with a baby--These two festive mice are dressed up with their cute baby plays baby Jesus. Shepherd Mouse with Lamb--This cute mouse is to play the Shepherd part in the Nativity Pageant.